Turrall Fly Pod Klinkhammer Selection, the Klinkhammer was devised by a Dutch angler Hans van Klinken, in the early 80's to imitate an emerging caddis fly to catch grayling and trout which feed from them as they float in the surface film. This pattern has proven to be an extremely effective fly both on rivers and stillwaters. 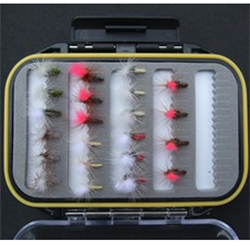 Turrall Fly Pod Klinkhammer Selection contains 22 flies in 7 different colours.